For two hours this past Wednesday evening, I had the privilege of watching 19 films, created by my classmates, that delved into issues ranging from hypermasculinity, heteronormativity, and gendered identities; to body art and piercings as forms of self-expression and the epidemic of skin bleaching in Jamaica; from cellphone etiquette and voter rights, to reconciling tensions in transnational identities and ideas of democracy; from dispelling assumptions to calling for action, this collection of media pieces was nothing short of brilliant. The assignment for the second media project was to: Create a piece of media–video/film, audio/podcast, photo essay–that reflects a perspective on a social issue. Texts can be no longer than 3 minutes. That was it. That was all we got in terms of parameters for the assignment. Great, right? Well sure, in some ways, this was awesome: we were given the opportunity to pick a social issue of interest and relevance to us and to explore that topic through a variety of media and modes. Open-ended, personalized, excellent! In other ways, however, this proved to be way more difficult than I had initially anticipated: not only did I have to determine how I was thinking about the notion of a “social issue,” (which I’m loosely defining as a topic and/or reality, situated in a social space or occurring within sociocultural practices that is in need of attention. “In need of attention,” however, does not necessarily mean that it is a problem, nor does it mean it is something that needs to be “fixed.” No, it is rather a practice, a phenomenon, a noteworthy piece of a new layer of the social fabric). In October, I finally got in touch with one of the co-founders of the group, through someone who I met at a hip hop education conference in September. Clifton Johnson is a 22-year-old, black male, born and raised in New York City. He recently graduated from Penn State in 2011 with a degree in business management. In our first meeting I learned that he never listened to hip hop growing up; that he was one of 6 out of 27 students who graduated high and went to college (he started high school with 300 students in his class); about why he’s so passionate about music and creating positive messages through his work; and why he wants to go into politics in order to make changes to the broken systems he grew up in. For my project, I was particularly interested in conveying how this group, comprised predominantly of black male youth, is creating a counter-narrative to the dominant ideologies of what “hip hop” is today, who they are expected (or assumed) to be and how they need to dress and act to be considered “cool.” Many of the members of Tribe NYC, made up of artists: rappers, models, actors, designers, singers, dancers, etc. 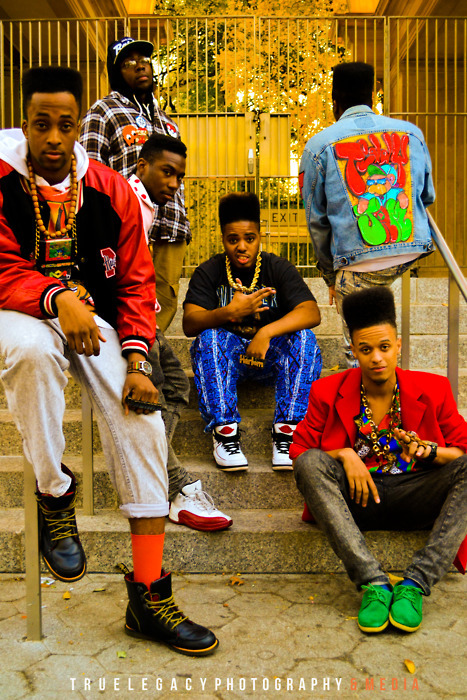 were infants in the late 80s, some were not even born until after 1990, yet they dress in the retro styles from that time period not only to pay homage to what the Golden Era of hip-hop represents for urban Black Americans—a time and space of cultural significance and artistic expression—but also to set themselves apart from the mainstream assumptions of what urban black youth look like and stand for today. Hip-hop is more than a musical genre. It is a lifestyle, a subculture and a sociopolitical movement that began in the late 1970s/early 1980s in response to a time characterized by “‘deindustrialization, economic restructuring and a resurgence of racism’” (Lipsitz, 1994, in Clay, 2003, p.1348), particularly in urban areas like New York City. 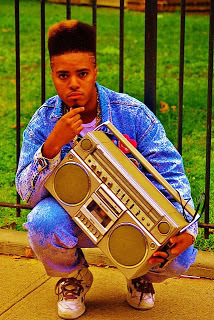 Hip-hop provided a new and unique space and platform for marginalized populations to speak out about and push back against oppressive, dominant ideologies and cultural practices at work. As it has evolved over the past few decades, “…the creative practices and messages constructed in [hip hop] music [have] woven into the processes of identity formation by which youth and young adults conceive of themselves, others, and the world around them” (Petaucher, 2007, p.947). My interview with Cliff lasted for almost two hours. I came into the interview with a few general questions that touched on an array of topics that I hoped would help to guide our conversation. We touched on many of the topics during our initial conversation in October, but Cliff did not mind answering the questions again in November, and he provided more information and insight the second time than I think either of us expected. He is incredibly knowledgeable about the history and business of hip hop, and is also highly media literate and voraciously committed to spurring social change through his music and activism. 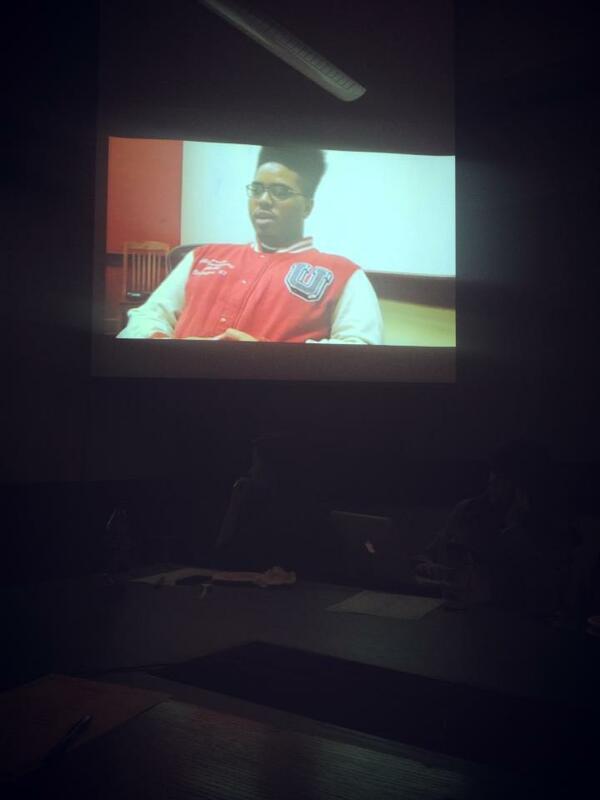 The topics he talked about included: the crucial role that social media has played in creating and sustaining Tribe NYC; how the members of the group are all helping each other to “make it” in the entertainment and arts industries, while also working for social change through creation and dress; why they wear vintage clothing not only to represent the Golden Era, but also to make a statement about how they can inexpensively put a stylish outfit together;** how the construction of the Cross-Bronx Expressway catalyzed the birth of hip-hop in New York; why rock and pop music provided more of an emotional outlet than hip-hop did when he was growing up, and how he ultimately came to love hip-hop because of Lupe Fiasco; why all hip-hop music should be “conscious,” but how the politics of the corporate music industry have watered down the genre; about how Puffy, Kanye West, J. Cole, and 2 Chainz all have college degrees, but how this important fact is very rarely included in the meta-narrative about hip-hop because it would run the risk of the making the product less “authentic.” This list merely scratches the surface of everything that we talked about in our two hours together. Needless to say, it was challenging to discriminate which aspects of the interview were really interesting and which segments were necessary and relevant to the task at hand. At the screening, my piece was assigned to the category: “I Stand Corrected.” My professor noted that the three pieces in this group proved to be a bit harder to classify than the other sixteen, which I think had more explicit takeaway messages. As soon as I saw the title of the section, I thought to myself, “Yes, perfect!” The phrase fully captured the sentiment that I was striving to convey in my film: providing the space for a youth voice and perspective on evoking social change to be heard. After conducting my interview a few weeks ago, it became clear that Cliff’s voice and presence on-screen were mandatory and crucial for telling this story, because it was his story. As a result, through the editing process, the piece took on an increasingly narrative form, which I was aware of, but did not realize just how narrative it was until it was contextualized amongst the other films. I phrase it in this way not to compare it to the other approaches and determine whether it was the “correct” way to convey a social issue; but rather to reaffirm that this was absolutely the best and right way for me to present my social issue. The reactions that I received during the brief question and answer session afterwards also reaffirmed that I had successfully conveyed my message; but it was my classmate (and good friend), a black male in his late 20s, who provided me with the most touching and reifying feedback. He said that he really appreciated my topic and was especially moved by Cliff’s story about not listening to hip-hop as a kid because he did not feel like it represented or spoke to him. With big eyes and an honest look on his face, he simply offered, “That was me growing up. I know what that feels like.” I got chills when he said this, and there are tears in my eyes as I type this now. I think my friend was able to connect to Cliff’s experience because it was Cliff who got to tell his own story in the film: we not only heard his voice, we saw his face, and saw footage of his music video Arizona Tea, a song largely about his childhood. Vasudevan (2010) argues that the relationships between literacies and modalities “profoundly impact and are shaped by the spaces in which they are engaged and the spaces produced through their engagement” (p.77). I think that the audience was able to “read” Cliff and interpret my film as a social issue because of the piece’s multimodality, which “afford[ed] not just a new way to make meaning, but a different kind of meaning” (Hull & Nelson, 2005, p.2). The past fifteen weeks of this course have been nothing short of monumental in my own doctoral studies, as well as in my growth as an academic, as a woman, as a media literacy educator, as a white ally and advocate of anti-racism, and as a member of the Millennial generation (someone who knew childhood without the Internet and cell phones, but who is also incredibly comfortable and excited about the prospects of how bringing new technologies and media texts into the classroom may help to fundamentally change education. This course embodies the notion of a “pedagogy of collegiality” (Soep and Chavez, 2005), where young people and adults, or in this case adult students and professors, mutually depend on and grow from one another’s skills, opinions, experiences, and collaborative efforts to authentically engage and generate original work. This is what I imagine a classroom informed by and committed to the tenets of media literacy and critical pedagogy should look like, and Lalitha’s vision and structure of the course demonstrates how both can be seamlessly integrated into a curriculum. I have been repeatedly inspired in and by this class and I’m grateful to have been a part of the work that we collectively produced this semester. As previously mentioned, my main goal for this project was to challenge the assumptions that people may have about the kind of relationship that urban youth have to hip hop; and more importantly, to convey this message about youth and social change from a youth’s perspective. I wanted to raise/promote awareness about the power and importance of youth voice and expression. If this sparks conversation or peaks interest among educators—especially young, pre- and in-service teachers who are a little closer to this music genre, sociocultural movement, and generation—about learning how to better incorporate student narratives into the classroom, or recognizing the significance of youth social movements, then I will be happy. * I recognize that I too was “reading” the members of Tribe from afar for months (and that people of color get read in negative ways on a daily basis, in ways that I have the privilege of not having to think about on a daily basis), possibly making assumptions about them, but I like to think that I was reading them in a different and more critical way—not as a typified group of “urban youth,” but as a unique group of youth of color who were being purposeful in their dress and behavior for a reason. ** In this part of the conversation, Cliff talked about the messages in celebrity culture (hip hop and rap artists in particular) and the residual social and peer pressures that urban kids feel to dress a certain way to be “cool.” He views Tribe NYC as affecting social change through their dress, conveying the message that you don’t have to spend thousands of dollars to look stylish.